Allan Kronzek became fascinated by magic tricks when he was 9. Now a professional magician and New York Times best-selling author, he shares 100-plus tricks, stunts and brainteasers in “Grandpa Magic” (Workman Publishing, Amazon, Barnes & Noble) that he promises are easy to learn and will give grandchildren giggles, jaw-dropping awe and wonderful memories. 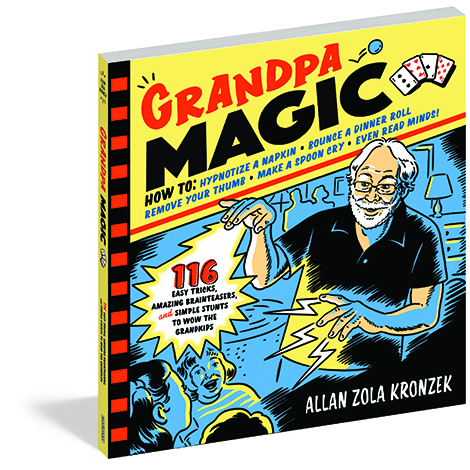 From the old pull-a-quarter-from-behind-a-kid’s-ear and “removing your thumb” to card tricks, stunts for the dinner table, and verbal puzzles that surprise and delight, the tricks are illustrated step-by-step to make grandparenting even more fun, Kronzek says. Log in | 49 queries. 1.324 seconds.